Not sure which cloud is the right option for your SAP environment? Managecore can help you find the answer. Our virtual cloud approach starts with the idea that there is no “one size fits all” when it comes to hosting your most critical application. We live in an increasingly connected world. Now, where an application resides is much less important than access, performance and cost effectiveness. Managecore can help you decide on the right solution, and then support your SAP environment, wherever it is. 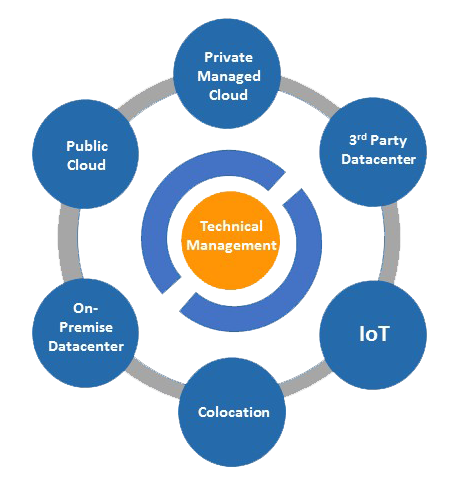 Whether it’s in Managecore’s private cloud, a public cloud such as AWS or Azure, or even if it’s in your own data center; our support structure and toolsets are specifically designed to be flexible and provide the ability to move application workloads as your business needs change. Unlike other vendors that only offer one choice, we don’t lock you into a single architecture. With our virtual cloud support, you can have workloads in different clouds at the same time and move them as your requirements change. For example, many businesses run sandboxes and other non-productive SAP systems in the public cloud, while running their productive systems in a private cloud. At Managecore we know that just as no two businesses are alike, decision criteria for moving to the cloud can be just as unique. Let us help you determine the best location for your SAP environment. Flexibility - how dynamic is your environment? Let’s talk about how you can be more confident in your systems today. Here are some things to consider when deciding to move your SAP environment.